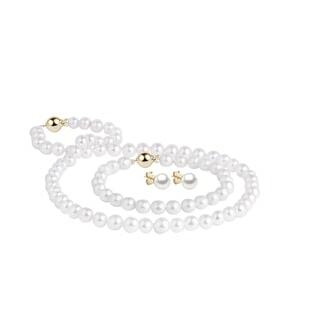 If you’re looking for a perfect, classic string of pearls for your jewellery box, look no further than our luxurious Akoya pearls. Akoyas are the most popular pearl--we use them for necklaces, bracelets and earrings--because their white colour has gentle rose undertones that gracefully complement every skin tone. Perhaps that’s why the Akoya has been the specialty of Japanese pearl farms since the early 1920s! Don’t miss our gorgeous collection of freshwater pearls, too!